Bora Bora is the incarnation of beach partying. Here suntanned bodies dance to electronic dance music's summer hits on the tables, in the sand, with a drink in their hands and the other waving to the low-flying planes overhead. Named after arguably one of the most beautiful island locations in the world near Tahiti in the Pacific Ocean, this is the definitive beach bar in Playa d'en Bossa, as it is a venue that has mastered the fine balance between club, bar and beach. 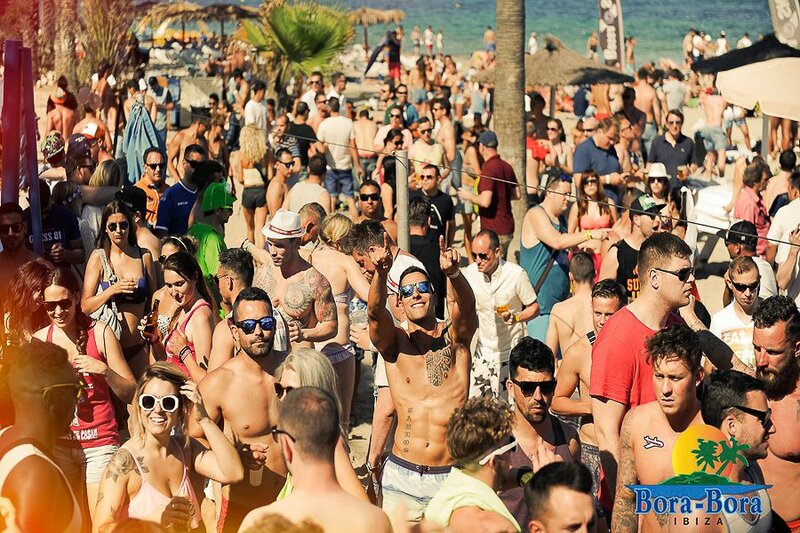 Of course, Bora Bora is not new; it's actually one of those places that have been around long before Playa d'en Bossa became the destination it is today. Every day of the week has proper parties going on. Bora Bora has stepped up its game by inviting more and more big-name guest DJs coming to play the venue. Aside from resident DJs, expect occasional surprise visits by major international DJs. You can expect cool, underground vibes to be played out of the impressive VOID sound system (the same one you would find in the DC10 terrace). The party always moves inside at midnight on the dot. A new area was born in summer 2017. With the Bora Bora apartments refurbishment, pool parties have been added to the beach parties. Now known as El Patio, they host parties the likes of Music On after parties and other surprises. For the definitive clubbing holiday, stay directly in the Bora Bora Apartments, which Bora Bora is part of, or have a look at other Hotels in Playa den Bossa. Drink prices are affordable and the atmosphere is pretty relaxed with people allowed to dance pretty much wherever they choose. There is also a more chilled side to Bora Bora, with food available in the large beach-front seating, and sports available to watch on the big TVs. Totally free entrance all day and all night. Drinks, however, can get pricey, especially after 18:00. Expect to pay standard club prices: €7 to 8 for a beer and €8 to 12 for long drinks.